Disclosure: This post contains some affiliate links, which means I receive a small commission if you make a purchase using the some of links above. I absolutely LOVE this time of year! I love the cooler weather and the clothes that is brings (jackets and boots especially), I love the holidays that happen in Fall, and I love the decor. I am so excited to share this tutorial with you today. The other night I had a craft night with my friend. She proclaims to not be crafty. I do not believe it, but that is what she says. So I wanted to see how she did on this craft. I asked my husband after she left and he told me that her banner looked just as good as mine! So there you have it. 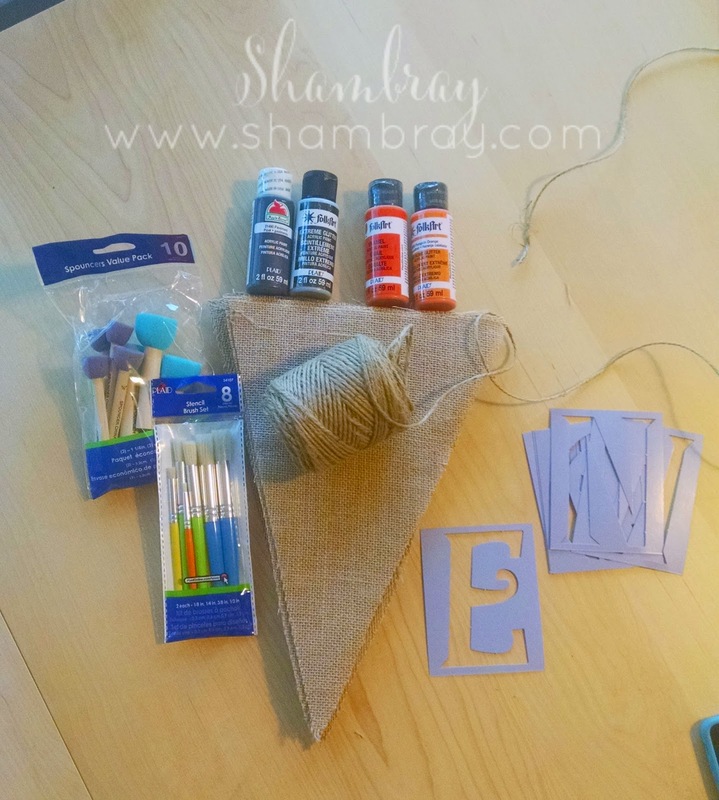 This craft can be done by the self-proclaimed non-crafty people. I promise! There really aren't that many steps involved in making this banner. Step 1: Gather all your material. Michelle cut this out for me before she came over. I was so thankful. We did ours 11 inches long. The bottom of the triangle above is 9. Using a rotary cutter makes it even easier. I am not a sewer, so I do not have one yet. I should get one though. 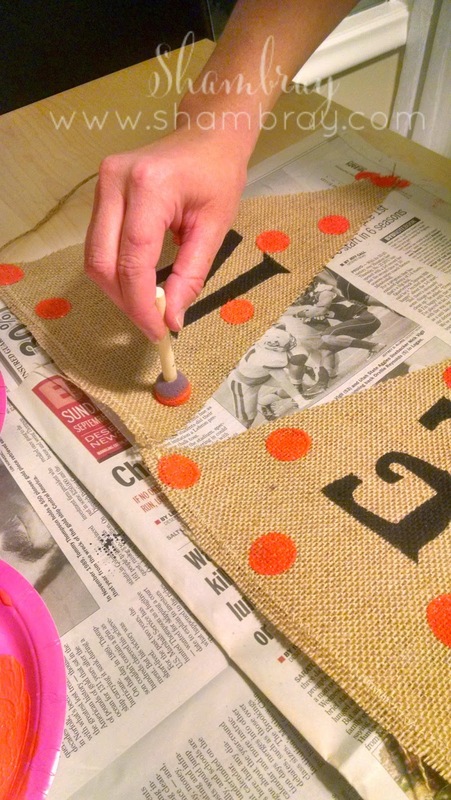 Step 3: Sew the jute to the burlap pendants. I do not have a picture of the actual sewing (done by Michelle) because I was distracted by our little ones. 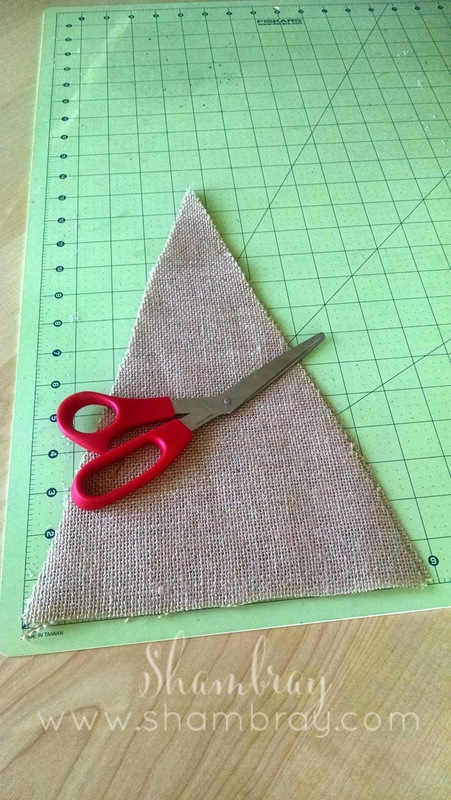 However, a tip for this step is to use a zig zag stitch so it is easier for you to "hit" the jute. Step 4: Paint on the letters. Take a stencil brush and dab it in the paint. Then you will dab the paint on the burlap. 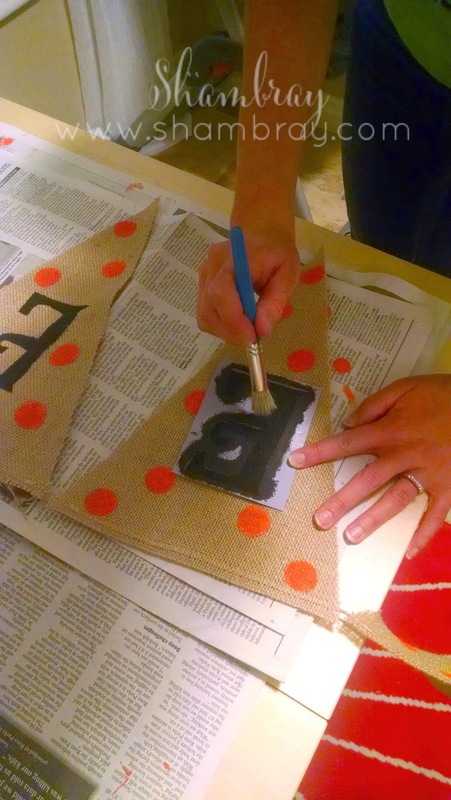 You do not want to put the paint on in long streaks because you do not want the paint to bleed under the stencil. If you dab it then it will not bleed. 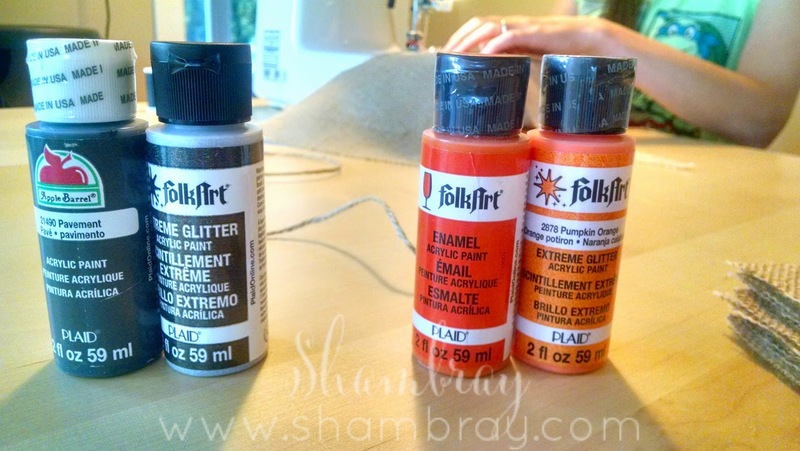 Once you have painted all the letters on the pendants you can go back and add glitter (if you want). You could also buy black paint with glitter in it as well. We did not know what we wanted to do so we purchased them separately. I added it to mine, but it was VERY subtle. You have to look very closely to see it. Step 5: Put on the orange dots. Randomly "spounce" on the dots. Yes I just made up the word. The nice thing about this is that you can put as little or as many as you like. You can add glitter on top of the dots as well. I did on some of them, but again they are very subtle. Step 6: Let dry overnight and then hang up. I love the way it turned out. I love burlap and I love polka dots. This banner is a PERFECT combination. My daughter loves saying the letters too. Right now "O" is her letter of choice and she is so excited there is an "O" on the banner. FYI: If you do not have time to make this or you still feel like it is too challenging for you to do on your own, then you are in luck! 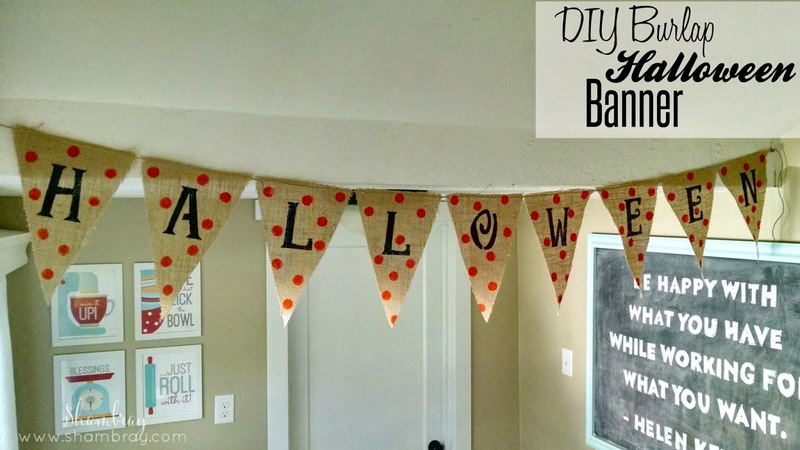 I have had a lot of people love this banner and so I have started making some to sell. I am selling them for $18. If you are interested in buying one then send an email to support@shambray.com. I have linked up with The Party Bunch, Monday Funday, Much Ado About Monday, Take-A-Look Tuesday, Too Cute Tuesdays, Party In Your PJs, Show Me What You Got, Look what I made Wed, Hit Me With Your Best Shot, Wow Me Wednesday, Whatever Goes Wednesday, Whimsy Wednesday, Show + Tell, Artsy Corner Thursday, The Creative Exchange, Thrifty Thursday Link Party, Handmade Hangout Party, Creativity Unleashed, Flaunt it Friday, Pinworthy Projects Party, Frugal Friday, Inspiration Gallery Link Party, City of Links, The Link Party Palooza, The Creative Collection, Friday Favorites, Frugal Friday, Linky Party: DIY Inspired, Super Saturday! Love what you created. 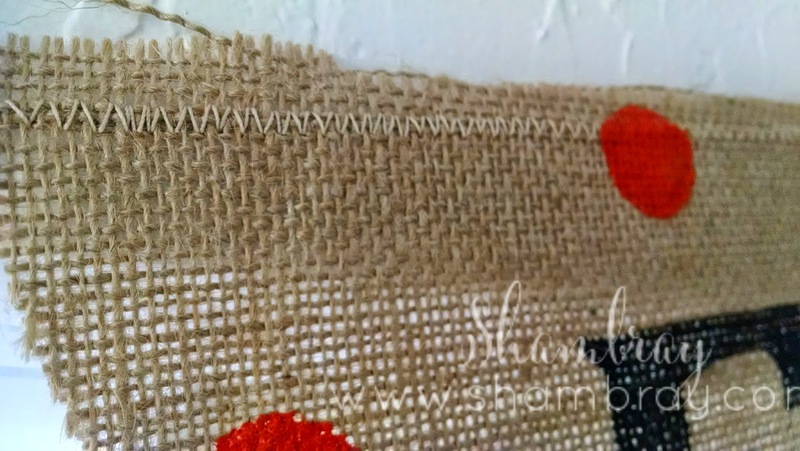 I have burlap but never sure what to do with it. I'll have to try this. 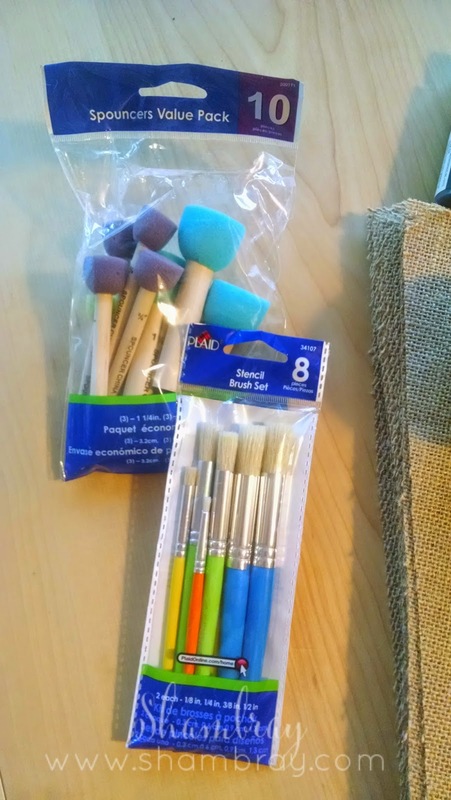 I have most of the supplies too! Thanks for linking up with us at this weeks Social Media Mixer. Enjoy your week!